One in five corporate workers have missed work in the past year due to stress, anxiety or depression. 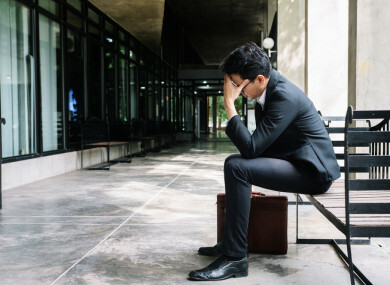 A LARGE PROPORTION of Ireland’s corporate employees suffer from concerning levels of stress, anxiety and depression, a new study has found. VHI has today published the first in a series of in-depth research reports into the health of Ireland’s corporate employees, which focuses on mental health in the workplace. A total of 78% of those surveyed believe mental health issues are of increasing concern, while 67% say they need to take more care of their mental health. The report found that more than one in five corporate employees feel extremely or very stressed. Of those employees under the age of 34, one-quarter of those surveyed said they find life extremely or very stressful. Of all corporate employees surveyed, 41% think that the amount of stress in their lives now is more than five years ago. 33% said that the stress in their jobs would cause them to consider moving jobs. One in five have missed work in the past year due to stress, anxiety or depression. The report also found that women, employees in the technology sector and those under 34 are most likely to worry about mental health and diet. Half of those surveyed feel they must disguise the stress they feel at work to maintain their career prospects. “There has been a lot of anecdotal evidence suggesting that workplace stress is increasing. This research is valuable in quantifying how significant this issue is and who is suffering most from stress and anxiety,” Professor Brendan Kelly of Trinity College Dublin, who is a member of VHI’s expert group, said. “The level of mental health issues identified is concerning and with many respondents stating they believe it will impact their health in the future, it is clearly a growing problem,” he said. The VHI expert group has made a series of recommendations in response to the findings. The group presented five options to those taking part in the survey, including a mindfulness course, digital support, counselling, and workplace discussions about mental health. Mindfulness was the most popular option with 67% having a willingness to take a course on the topic. Digital support came in second place, while the least popular option being to discuss mental health issues with an employer. The VHI survey focused on those up to 45 years working in the corporate sector and included 392 employees from across all sectors who work in businesses of over 100 employees. The survey was conducted online by B&A. Email “Almost 80% of corporate workers are concerned over mental health, study finds”. Feedback on “Almost 80% of corporate workers are concerned over mental health, study finds”.